In the 2008 election campaign, candidates increasingly relied on tools such as email and text messaging to reach out directly to supporters outside of the media or traditional communications channels such as television or radio. Obama supporters in particular have a strong expectation that these communications will continue as the new administration takes office. Fully 46% of all Obama voters (and 51% of those who go online) expect to hear directly from Barack Obama or other officials affiliated with the new administration at least occasionally over the next year, and 15% of Obama voters expect to hear from the new administration on at least a weekly basis. Notably, Obama supporters who use email and social networking sites not only expect continued communication with the administration through these channels, they also expect these communications to occur with greater frequency than mail or telephone contacts. 37% of Obama voters who use social networking sites expect to receive updates from the administration on these sites. Most expect to receive these updates on either a weekly (12%) or monthly (11%) basis, while 14% expect them to occur less frequently. 34% of Obama voters who use email expect to hear from the new administration via email. One in ten (10%) expect to receive these email contacts on a weekly basis, and 9% expect to do so monthly. 38% of all Obama voters expect to hear from the administration via mail. Some 7% expect to receive mail from the new administration on a weekly basis and 12% expect to do so monthly, while 19% expect to be contacted by mail just a few times a year. 17% of all Obama voters expect to receive phone calls from the new administration at least occasionally. Just 2% expect to receive phone calls on a weekly basis, and most (10%) would prefer these communications to take place a few times a year. 11% of Obama voters who own cell phones and use text messaging expect to be contacted by text messaging, with most (6%) preferring that these text message contacts occur less than once a month. At the moment, McCain supporters do not have the same expectations of regular direct contact with their party or its leaders as Obama supporters. One-third (33%) of McCain voters expect to have such contact at least occasionally over the next year in one form or another (vs. 46% of Obama voters), while just 4% expect to be contacted on a weekly basis (vs. 15% of Obama voters). 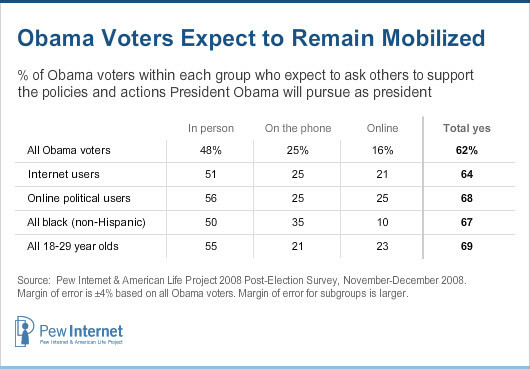 The differences between Obama and McCain voters are particularly pronounced when it comes to online contact. Tech-using Obama supporters have a much greater expectation of direct future contact with their “team” than do tech-using McCain voters. A large number of Americans intend to carry on the campaign debate into the first year of the Obama Administration. Some 31% of Americans say they expect to ask other people to support some Obama policies in personal conversations; 16% say they expect to ask others to back President Obama in phone conversations; and 10% say they expect to ask others to support Obama using online methods. Reflecting the campaign’s focus on online mobilization and voter engagement, those Obama voters who were highly engaged in the online campaign expect to be particularly engaged in promoting the administration’s agenda, especially online. Among online political users who voted for the Obama ticket, fully 68% say that they expect to press others to support the new administration’s policies in the coming year. Fully 25% of these engaged online activists say that they will likely use the internet to encourage others to support president Obama’s policy agenda in the year ahead.